Gomberg: It has classic cars, tightrope walkers and an actual wizard! 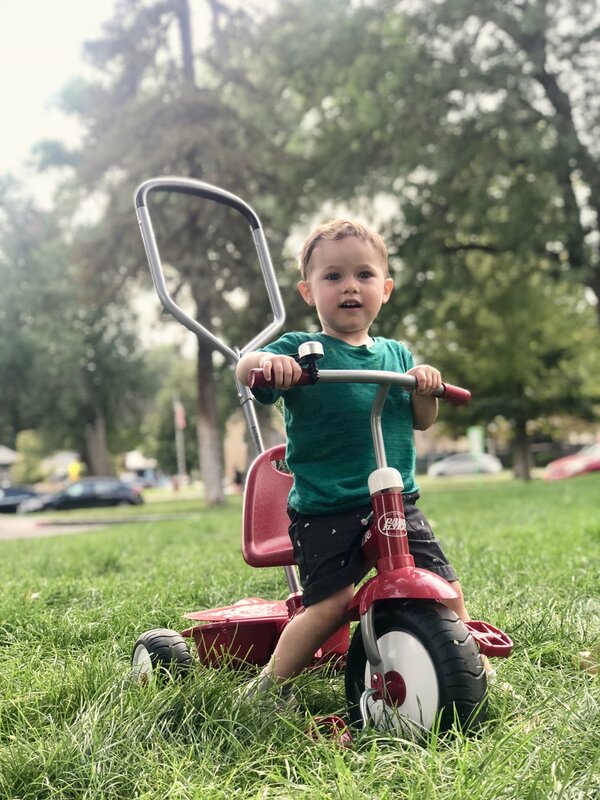 How my son helped me fall in love with Liberty Park. (Courtesy of Marina Gomberg) Harvey Gomberg is a big fan of Liberty Park, and that has rubbed off on his mamas, Marina and Elenor Gomberg. I’m Mimi, and he’s referring to his nearly constant desire to walk to Salt Lake City’s Liberty Park, the 80-acre urban oasis of more oxygenated air and abundant recreation. I think part of his current obsession is the school bus parked at the church we pass on our half-mile walk (“Big wheel, Mama!”). But even when he’s not bus-obsessed, that kid loves the park. And so do his mamas, so it doesn’t take much to persuade us to put on our shoes, grab the trusty mom bag (replete with snacks, diapers, sunscreen, Band-Aids and fresh water) and head out the door. We moved to the neighborhood a little more than a year ago and quickly became park regulars. I guess I had always known the park existed and that the aviary was there, but I really had no idea how big, thoughtful, well-maintained and well-used it is. Every time we’d stroll over that first summer, we’d discover something new. And although we never bumped into Mike Earl walking his 100-pound tortoise, everything from the folk art museum and the Friday farmers market to the costumed sword fighters and old-timey car people delighted me to no end. Did you know there’s a year-round tennis club there, a big public pool and the playground of all playgrounds? You want to buy some Navajo jewelry or leather? Swing by the east side on Sundays. Want to relive your elementary school glory days? The kickball league plays Wednesday and Thursday nights. Amusement park rides? Weekends. Skilled and unskilled rollerbladers? Daily. I’m talking ducks, tightrope walkers, chipmunks, a splash pad and a guy who I’m fairly certain is an actual wizard. This park has everything! Even thrill seekers can get a good adrenaline rush there just by traveling the wrong direction on the outer exercise path (I wonder if the French call that a faux park). I got my own jolt the other day when a stubborn and speedy elderly man taught me a lesson about the “BIKE LANE!” after he nearly mowed me down in righteous indignation. Whoosh! Thanks for the elevated heart rate, dude! But, Angry Biker aside, I’m so often charmed by how kind park people are. Like the one guy who rollerbladed the “wrong” direction so he could high-five all of us rule-following counterclockwise movers. See you in 10 for another one, guy! Maybe it’s because we’re all there to unwind or are high on endorphins from exercising, but there seems to be an abundance of eye contact, smiles and no-you-go-right-aheads. It feels like such a magical place to be, and I find myself surprised at how much a patch of grass and a couple of trees could enrich my life. I feel like I have a whole new appreciation for open spaces and the people who like to fill them. So, get your shoes on, kiddo. Let’s kick those bus tires and go have ourselves an adventure.